On a clear day from here you can normally see at any one time two or three vapour trails from transatlantic jets at 35,000 feet on their way to London's airports. For five days there have been none. The weather has been fine and the sky blue, so blue that it's easy to doubt whether the density of dust from the Eyjafjallajokull volcano in Iceland poses any real threat to aviation, or whether it is just bureaucrats being over-cautious. Whatever the risk, the aviation ban is real and there can be no-one in Britain who has not been affected by it one way or another. The first effect we noticed was when we went to a classical music concert last Friday in Carlisle. The piano soloist was unable to get there so the Mozart piano concerto was played by a stand-in. I received an email from one Hong Kong eBay seller to tell me that the programming interface for the Motorola radio I bought at Blackpool which I ordered from him would take longer to arrive. I expect other items I have ordered from eBay and elsewhere, including a transmitter module for my dedicated Echolink node radio, will be similarly delayed, as there is no air mail. We take for granted that we can order things from China or the USA and have them in a few days. Not any longer. Friends of ours who are due to return from Ukraine tomorrow are probably not going to be able to make it unless London Luton airport is miraculously opened. They are due to return to work on Thursday and are very anxious not to provide their employers with an excuse to terminate their contracts. 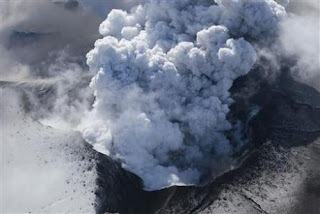 That's the situation now, but with seismologists saying that the volcano could continue to erupt off and on for the next year or two and even suggesting that another, larger Icelandic volcano is due for an eruption, what is the future for the airline industry? If there's a high probablility of getting stranded abroad like so many people are now, how many are going to decide to change their travel plans and stay close to home for the next few months? I will, for sure. I dare say canny investors will be selling airline shares and investing in shipping. And I don't suppose it will be long before the first package holiday companies start going bankrupt because of all the refunds and cancellations. Like the banking collapse, I think this is another event that is going to have permanent repercussions. Trust Nature to cut us down to size. We humans think we are so powerful we can end global warming, yet in a few hours the earth achieved what governments alone could never have managed - a complete grounding of aviation. I suspect that a really big volcanic eruption could have a bigger impact on global climate than any of the measures agreed by the politicians. Don't quite think it's as bad you're implying. Whilst there is definitely a risk the UK VACC has been using ICAO rules when dealing with Volcanic Ash, these have been fed into a model derived from ash dispersal within weather patterns. As has been seen this has had a major impact on EU aviation. So the original prognosis of shutting the airspace was correct as ICAO rules were followed. Now and about $2billion later a more accurate approach is being adopted. Which will still cause inconvenience but won't shut down all of Europe. With the sun still not showing much activity (look at the 10.7cm flux), the whole global warming scam has about as much credibility as Gordon Brown. We are on a planet made of red hot molten rock with a razor thin wisp of air on its surface. Close by is a gigantic fusion reactor providing all our heat, light and radiation. It is the heights of hubris to think we can in any way "destroy the planet", modify the weather, or do much more than cause temporary local fluctuations. I am banking on a little (or big) ice age. The earth seems to be shaking a lot more than usual lately (tsunamis, earthquakes) and the sun is not waking up. Hot toddies anyone?